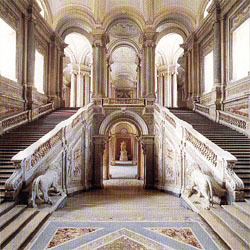 Of all the splendid works and constructions by which the Bourbon dynasty embellished and modernised the Kingdom of the Two Sicilies, the pride is the universally famous and appreciated Palace of Caserta. It was designed and mostly built by the Dutch architect Ludwig Van Wittel, who received the Italian onomatopoeic name of Vanvitelli. He was called to Naples by King Charles, who as the real grandchild of the Roi Soleil, wanted to build a new Royal Palace, a “residence” fit for a Bourbon King and his Court. 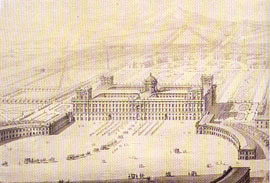 He wanted that because he wanted to have a royal palace not in Naples but very close to Naples (and in this we find a clear allusion to Versailles), but mainly because the new palace in the King’s intentions, had to be the most beautiful and largest royal palace in the world after Versailles, a pride for the new Kingdom he had conquered and a further evidence of his willingness to make this Kingdom an independent and sovereign one. Over the years, King Charles personally followed the work together with the Queen and they both were Vanvitelli’s inspirers, however without modifying the original design of the great architect. It was an excellent “union of souls”: evidence of this is given by Vanvitelli himself, in his periodic letters to his brother, where he always expressed his joy for the attention that the two Sovereigns paid to his work and for the good understanding that made the work progress quickly and with great profit. After the Sovereign left for Madrid in 1759, things never went as before and Vanvitelli always recalled the happy days of the 50’s, sometimes with a bitter regret. His expressions of regret for the absence of the “Catholic King” every time he completed a new part of the Palace (for instance the wonderful gardens) are famous; one day he said:«The construction work is going well, but what for? If the Catholic King were here it would be good, now it is nothing» (See Il Palazzo Reale di Caserta, a cure di G.M. JACOBITTI e A.M.
ROMANO, Electa Napoli 1994, p. 8. Another time Vanvitelli said that the Palace was taking splendid proportions, but without King Charles it was just like offering «Margaritas ad porcos»). The situation worsened when Tanucci [“Maligna creatura” lo chiamava Vanvitelli. Ibidem.] took control of the Kingdom and cut the money available to Vanvitelli. If in the 50’s some 2000 workers were employed in the construction, in the 60’s their number was halved. Despite that, he continued with the same passion and commitment. 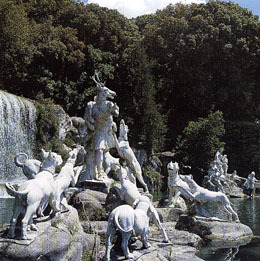 In 1766 Galiani arrived in Caserta. Galiani was the Secretary of the Neapolitan Embassy in Paris and noticing that the work had almost been completed, he openly praised the work and even said that the gardens were more beautiful and perfumed than those of Versailles. Vanvitelli, who by then was 65 and very sick (was thinking of leaving the conclusion of this work to his son Charles), was overjoyed in hearing this. Then in 1767 the Vesuvius gave him a hand: after a violent eruption, the young King Ferdinand IV decided to move the Court from Portici to Caserta and therefore he resumed his work in a more active way until his death in 1773; his son took over where he left, but changes were made until 1920. Its foundation stone was laid on 20 January 1752 in an official ceremony celebrating the 36th birthday of King Charles. 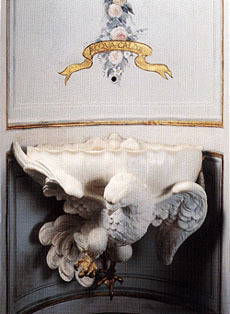 Vanvitelli had presented his project the previous year, on 2 May 1751. Charles and Maria Amalia were so enthusiast that the architect wrote his brother that reality had overcome his best expectations. However, the fastness imposed by the King was a clear sign of the importance and appreciation he gave to that work. The Palace had been designed as a huge building with twin facades, one looking on to the parade ground, the other to the gardens. The central dome and the statue of Charles on the gable in the middle of the facade were present in the original design but were never realised. For the first time, the central stairway leading to the royal apartments (we now find the Public Administration High School) was put at the centre of a building. In total, the Palace has 1200 rooms. 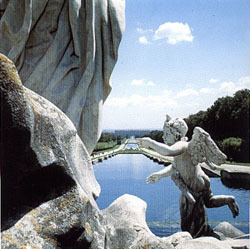 The gardens were completed after the King left the kingdom, and in 1762 the water from Maddaloni reached the Palace through the Caroline aqueduct. A description of the Palace and its gardens is impossible here. It is one of the most famous and loved architectural masterpieces in the world. We will limit ourselves to show some pictures and spend a few words on the most important and beautiful rooms. Entrance to the Palatine Chapel (similar to the one in Versailles) is from the upper hall. The Chapel is an unadorned and vaulted room with columns and a high stylobate. It was inaugurated by the Mass of Christmases Eve in 1784, at the presence of the King and all the Court. The chapel is dedicated to Mary Immaculate, whose image is painted on the apse. A mention must be made to the Rooms of the Seasons, small and highly decorated rooms. In the room of “spring”, the King and Queen welcomed their most intimate guests and Hackert embellished it with some splendid views of harbours. German pieces of furniture, the apartment of Queen Maria Carolina is somehow frivolous and elegant. Once crossed the three neoclassical rooms of the Palatine Library, we reach the Elliptic Room, all white washed, without decorations, destined to the Court recreation; it presently houses the enchanting Bourbon Crib. 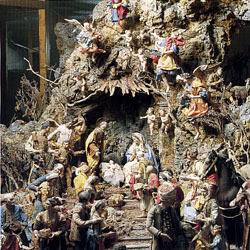 The Bourbons always encouraged the ancient Neapolitan tradition of the Crib and every Christmas a huge crib was prepared in the Palace by expert artisans but also by the Princesses, who tailored the dresses of the shepherds. The hands, heads and feet of the statuettes were made of clay, whereas the body was made of stow and wire. Real designs were realised for the crib: the last one was made in 1844, and the present crib in the Palace is inspired by that last project. Leaving the Elliptical Room, we entry the splendid Art Gallery, recently furnished with the portraits of the Sovereigns. But even more important is the area dedicated to the splendid landscapes that Ferdinand IV ordered to J.P. Hackert, the other famous artist who worked in the Palace of Caserta. Born in Prenzlau in 1737, Hackert came to Italy in 1768 and here remained for the rest of his life. In 1782 he met King Ferdinand. The painter related how amazed he was to find that the King was so competent in painting and discussed it with cleverness and awareness. The two men immediately got along with each other (as the other King and artist had done thirty years before) and their agreement produced the splendid canvas now so admired in Caserta. Mention must be also made to the small and precious theatre, located in the western wing. The theatre was not foreseen in the first design, and Vanvitelli made it upon a precise will of King Charles in 1756, when the work had already begun. To conclude, no description can convey the beauty of the wonderful gardens and their enchanting sculptures, that can only be appreciated while personally seen. Only a visit to the place can give merit to the splendour of the Palace and the munificence of the Bourbons, makers of the most beautiful and largest Palaces in the world.